Editors Note: The story has been updated with a statement issued by the American Civil Liberties Union of Pennsylvania. A family owned Amish farm tucked off the banks of the Conestoga River in Lancaster County, Pennsylvania is now home to an encampment and workshop for environmental and community activists preparing for a showdown with the construction of the Atlantic Sunrise Pipeline. 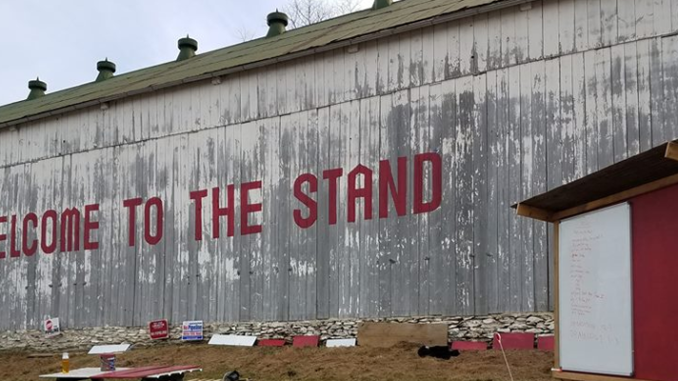 The encampment is now known simply as “The Stand.” The Stand and its old tobacco barn gained regional and national attention over the past six months as activists constructed two giant stands and began holding weekly non-violent mass action trainings. Local and state officials now appear worried that The Stand will become the next epicenter in the fight against pipeline expansion in the United States – and they are doing everything they can to stop it. The first overreach came in early March when Conestoga township officials slapped a condemnation notice on the Stand’s tobacco barn, which was being used to hold meetings and trainings. The building’s owners faced a thousand dollar a day fine for using the ban for “non-agricultural purposes,” but the notice was revoked days later when over 150 residents packed a Conestoga township meeting to complain about it. The latest overreach is coming from Republican State Senators Mike Regan and Scott Martin who have introduced, or are working on, “anti-terror” and civil liability bills that are part of a national trend to label environmental activists as economic terrorists. Senator Scott Martin’s civil liability legislation is not published yet, but according to a cosponsor memo, it would “allow for the recovery of costs by holding a person or persons civilly liable for response costs related to a demonstration if the person is convicted for rioting or is a public nuisance.” When speaking at an emergency preparedness seminar last week, Senator Martin explained that the seminar was not about pipelines, but about “protecting our communities.” He then goes on to say “there is work being done in Harrisburg. I will tell you on this. There is a senate bill that is looking on upping criminal penalties in regards to and expanding the scope of what is trespassing on a critical infrastructure site.” When talking about his own bill, Martin said “we’re also working on a civil liability bill. Now people who willfully allow things or sponsors them to happen and are identifiable individuals, when you utilize our resources in a way that is well beyond your free speech there could be a financial cost with that as well.” Those who attended the seminar included local enforcement officers and North Dakota officials who participated through Skype. The out-of-state officials included Ron Rauschenberger, the former Chief of Staff to North Dakota Governor Doug Burgum. State Senator Mike Regan’s “Critical Infrastructure Protection Act” originates in national anti-terror policy, and would slap environmental activists who “inhibit or impede” pipeline construction, fracking or other fossil fuel related operations with class two felony trespassing charges. Those prosecuted under Senator Regan’s new piece of legislation could face up to one year in prison and a $5,000 fine. Senator Regan’s bill was scheduled for a vote in the Senate Judiciary Committee on May 9th, but the bill was pulled from consideration when concerns about the class two felony were brought up. Senator Regan’s staff did not return questions about the motives behind the bill or the felony chargers. The legislation by Senators Regan and Martin are a microcosm of the ongoing Republican led efforts to criminalize protesting across the country. Common Dreams reports that “at least 19 U.S. States have introduced bills that attack the right to protest since Donald Trump’s election as president,” and The Intercept reports that Oklahoma Governor Mary Fallin just signed a critical infrastructure trespassing bill into law. The language in Senator Regan’s critical infrastructure bill and the bill Governor Mary Fallin signed into law are almost identical. The only difference is that the Oklahoma bill carries stiffer fines and prison terms. The Oklahoma legislation would also fine organizations up to one million dollars for if they are ‘”found to be a conspirator’ in occupations that damage or intend to damage such facilities or inhibit their operations.” Protesters who “impede or inhibit” pipeline construction in Oklahoma are looking at 10 years in prison and a $100,000 fine. The similarities between the two critical infrastructure bills begs to ask if they are an attempt by American Legislative Exchange Council (ALEC) or other oil and gas interests to designate environmental activists as economic terrorists. We will continue to cover these ALEC style bills as they begin to make their way through the legislature.